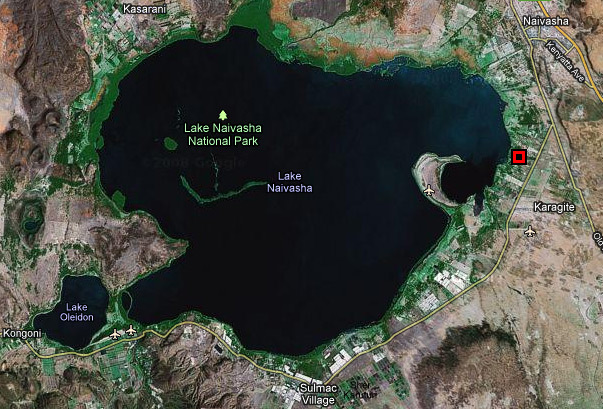 Lake Naivasha and red point as our start positionINFO: Lake Naivashaisa freshwater lake in Kenya, lying north west of Nairobi, outside the town of Naivasha. It is part of the Great Rift Valley. STORY: We started our day with an early breakfast in order to be in time for our pickup at 8:00 AM. We were being picked up by a young guy by the name of “Wilson”, who came driving in a large terrain jeep and which was working for the current company which we had engaged for our private safari. Our first visit was the Lake Naivasha game sanctury which was located north of Nairobi, and it took us more than two hours to reach the sanctuary. We were informed that we were going to spend the next few hours in a boat where we would be guided around the lake in order to explore the wildlife on and around the lake. The boat was quite big and suited for twelve persons, but luckily enough we were the only ones going that day. The wildlife on the lake was extensive and I had placed myself in the front of the boat with my camera secured on a tripod. I used Canon 1D mark IV and my favorite EF 400 mm F/2.8 L IS USM. I also had in my pocket 1.4 and 2X extender, but we always managed to get close enough to the objects, therefore I never needed any extender. 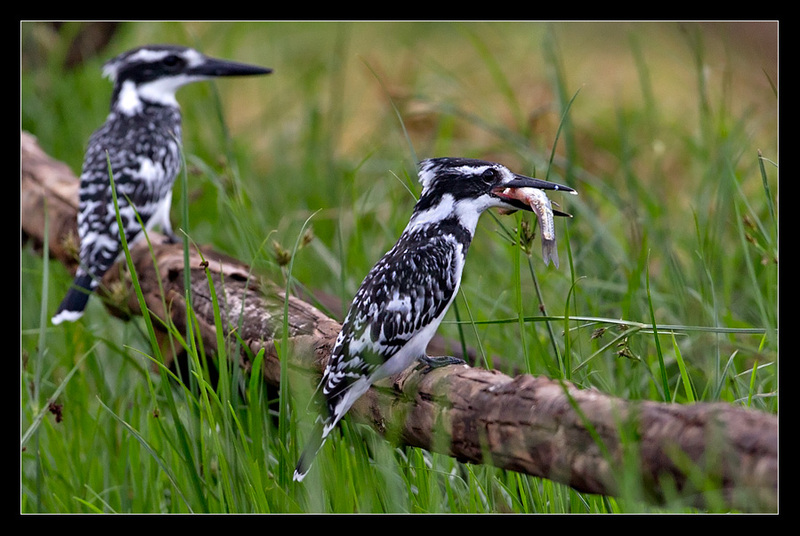 My biggest expectation was to see the African Fishing Eagle and Kingfisher in action. We saw three different kinds of Kingfishers (Great Kingfisher, Pied Kingfisher and Malachite Kingfisher) and a couple of them with a catch in their beak. 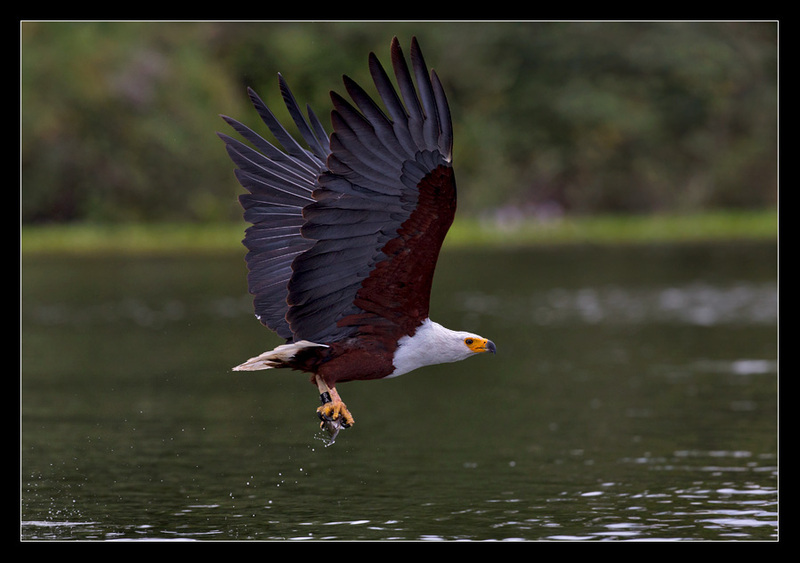 We were also fortunate enough to see the Fishing Eagle hunting for fish, and I even succeeded to get it on picture. I believe that we saw more than 30 different kinds of birds on the lake in less than two hours. Additionally, we discovered a few hippopotamuses as well, enjoying their bath in the lake. 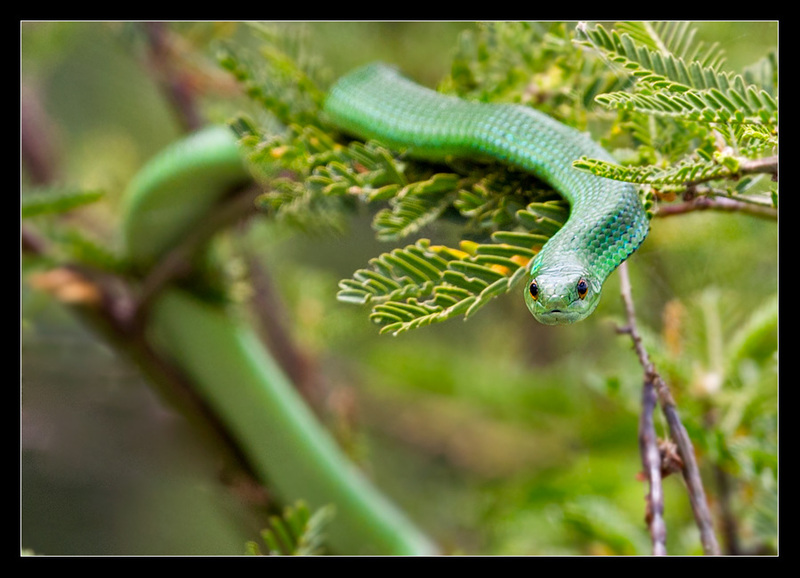 Almost by coincidence, Wilson discovered a little green snake, which had crawled up in a bush which was growing out in the water, and was hunting for insects from one of the branches. After the boat ride on the lake, we enjoyed a nice lunch in the beautiful garden at the Lake Naivasha Resort. There were plenty of birds flying around us in the garden and another one of my “bird favorites” came by, the Superb Starling, and I managed to get a picture. In the end of our lunch we got a special visitor, which was trying to steal the rest of the food from us. The visitor was a a big male Velvet monkey who was just waiting for Wilson to leave us, so that he could take action. Wilson had previously informed us that the monkeys don’t fear white people, therefore we were determined to see the intruder off, since we didn’t believe in that. Unbelievably, Wilson was correct, we clapped our hands and I even touched him on his back, but he just turned his head and looked at me like he was telling me “Don’t disturb me, can’t you see I am eating”, and continued as nothing had happened. The monkey didn’t leave until he saw Wilson running towards the table, trying to save what was left of his french fries. This concluded our day, and Wilson drove us to our new hotel which we checked in at, and there we were left to “recharge” for the next day’s adventures.